The remote desktop app Screens is a perennial resident of my iPhone’s utilities folder. Its polished and pleasant interface, reliability and speed have enabled it to crush all of the other options I’ve tried over the years. Now, Edovia, the makers of Screens, have taken a turn at making your iPhone or iPad an external monitor for your Mac, and the results are just as good. 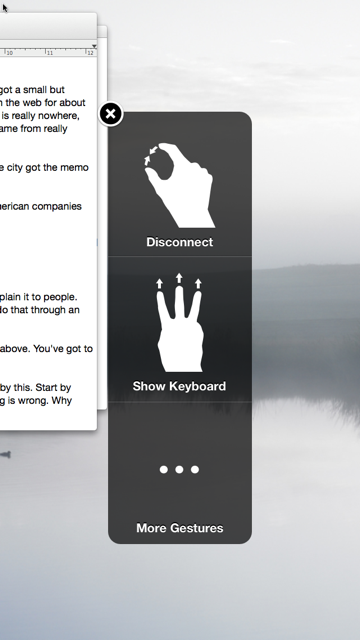 Mini Display is a deceptively simple app, with an interface that mirrors the setup of Screens. You download a free app from the Mac App Store and run it. Then you snag Mini Display from the App Store on your iDevice and launch it. As long as both of your devices are on the same WiFi network, you’ll see a screen appear that you can choose to add your iDevice to. Mini Display is lightning fast, with some very slight perceptible lag, but far less than other options I’ve tried like AirDisplay. The display is pixel-correct, taking full advantage of the iPhone and iPad’s Retina displays to extend your monitor. You can choose between ‘best’ resolution, which provides you with the best performance, or more real-estate. There are also a host of clever gestures for controlling your display, like pinching to close the connection and swiping with three fingers to bring up the keyboard. The documentation conveniently lists them all. The ideal application for this kind of thing is traveling, where screen real-estate is at a premium. I travel and work on an 11″ MacBook Air, and even with Mission Control and Spaces, it’s tough to keep track of certain things all the time, because every inch is in use. Adding even just an iPhone to stream a Twitter feed makes a huge difference. Even though I can stream Tweetbot, for instance, on my iPhone as a native app, I can’t click those links and open them in Chrome on my Mac. With Mini Display on a phone or iPad, I can. I had a chance to chat briefly with Luc Vandal of Edovia about Mini Display and how it compares to other offerings. 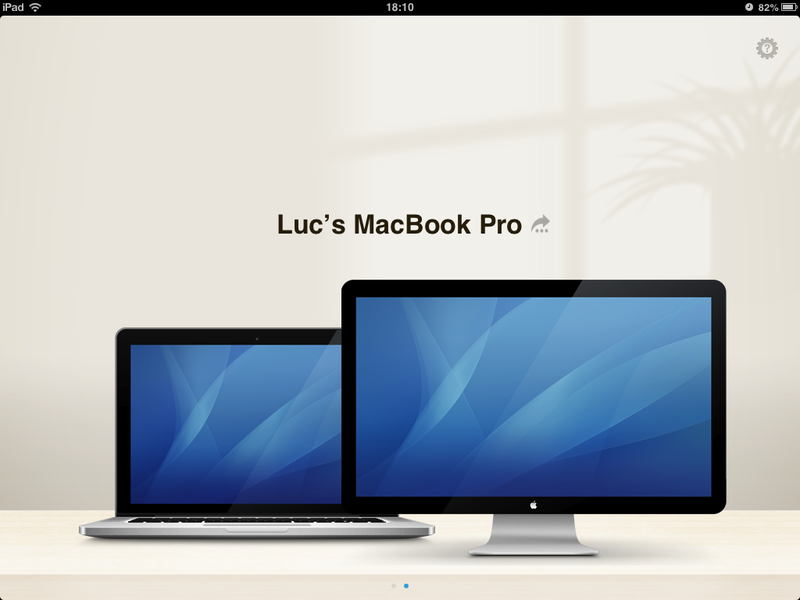 TNW: One of the first things that people will want to know, I’d think, is how Mini Display differs from AirDisplay? Vandal: I believe Mini Display is easier to use compared to our competitors. I hate when I have to figure out how to use an app, especially in the case of iOS apps that require a server app counterpart. Many times you’ll have settings or indications or steps that are spread between the two apps, which makes it a pain to use. What that in mind, we designed Mini Display so that everything is in the iOS app. The server app is only responsible to create those virtual displays and to broadcast the service. 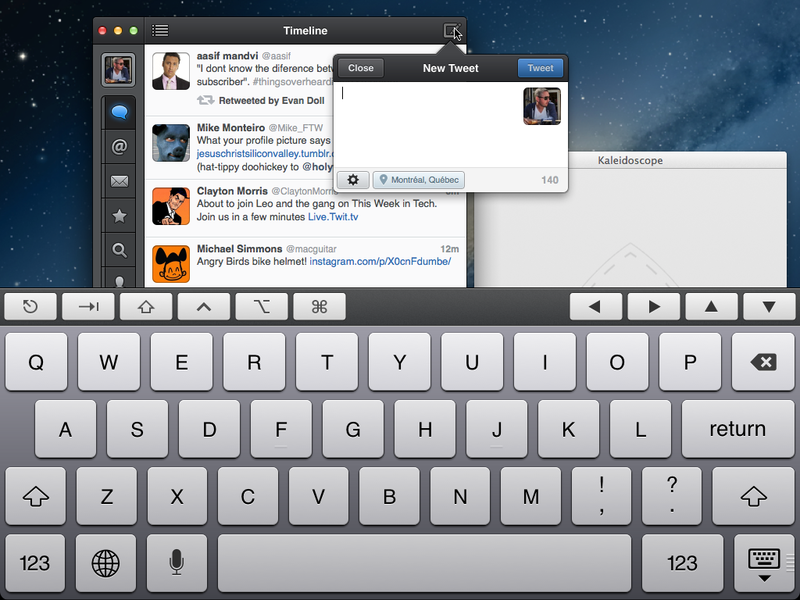 We also chose to rely on the built-in Screen Sharing service, which is part of OS X since 10.4 Tiger. By doing this, we were able to concentrate on other aspects of the app and of course, we know a thing or two regarding the VNC protocol! We also brought everything we’ve learned by developing Screens for the past few years so the app works pretty well with multi-touch gestures and the virtual keyboard alone. But in a nutshell, I think the main key point is how simple the app is to use. TNW: What made you decide on this as your next app? It seems to fit well thematically with Screens. Vandal: Mini Display is using a brand new VNC framework that we’ve built from scratch as the previous version of the framework dated from 2008. Some portion of it at least. So the code was a bit dated and we wanted to move to ARC so a complete re-write was inevitable. Since it’s a new framework, we decided to test it against a simpler app and moreover, we often need to test Screens with a second and even a third display so we decided to kill two birds with one stone and so Mini Display was born. A nice side-effect of developing Mini Display is that it brought up many performance issues that we rarely encounter with Screens. Even though both apps are basically VNC clients, they address different use cases and one of them so we were able to learn from that and we’ll be able to add this knowledge in the next version of Screens. TNW: Did you have difficulty with latency? That’s always been a big problem for me with display expanders, but Mini Display seems to work really well in that regard. Vandal: You have to think that you’re pushing a lot of pixels many times per second to a device that is memory, CPU and GPU limited. It’s even truer with the iPad with Retina display. That was quite a challenge and while we’re happy with the results, we want to improve responsiveness over the next few updates. Mini Display is available now for $12.99.